Boulder City High School’s football team is officially on a winning streak after defeating Pahrump Valley 32-28 on Friday. Peter Davis/Boulder City Review Boulder City High School's quarterback Parker Reynolds prepares to pass during Friday's, Sept. 7, 2018, game against Pahrump. The Eagles won 32-28. Peter Davis/Boulder City Review Boulder City High School's Thorsten Balmer, center, proves to be tough to take down. The senior rushed for 211 yards during Friday's game against Pahrump. Taking control of the game from the opening snap, the Eagles jumped out to a 14-0 lead before sacrificing a pair of touchdowns. 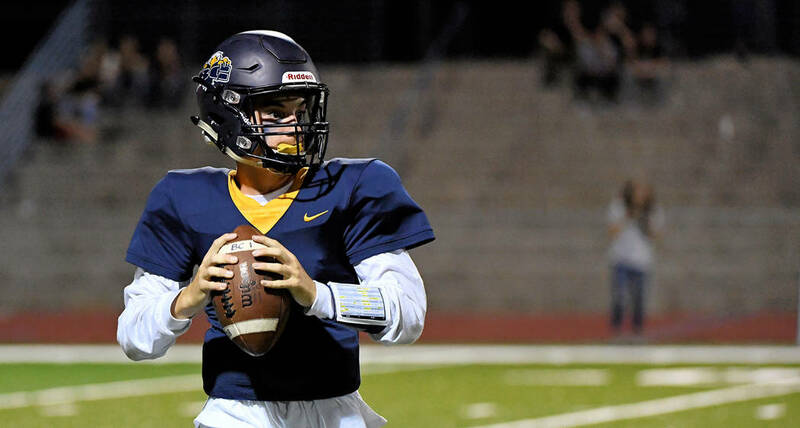 Junior quarterback Parker Reynolds was on point from the get-go in his third start from under center, linking up with seniors Jimmy Dunagan and Thorsten Balmer for touchdown strikes. Reynolds went 12-of-20 on the night for 162 yards and two touchdowns, helping the Eagles convert nine of their 14 third-down conversions. Reynolds also rushed for 28 yards and a pair of touchdowns, including a game-sealing 1-yard plunge to put the Eagles ahead with just over seven minutes remaining. Dunagan caught four passes for 64 yards and a 7-yard touchdown, while senior Shaun Jones caught four passes for 50 yards. 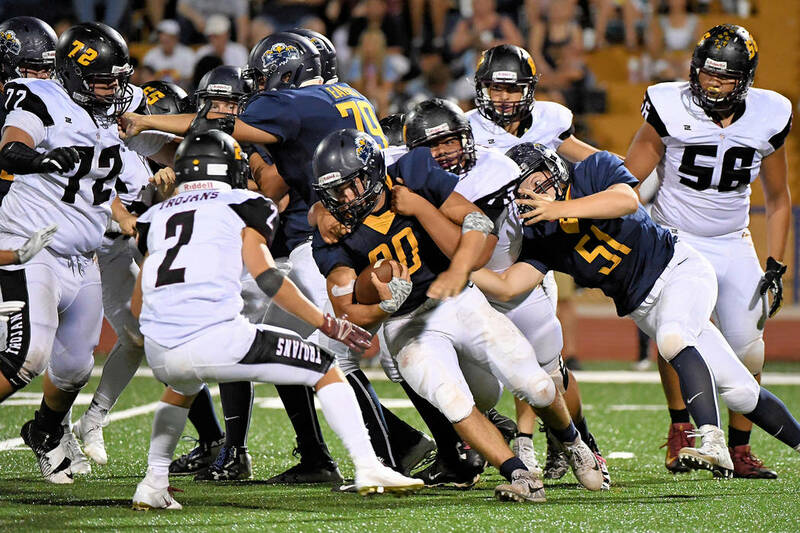 Turning in another dominant performance on the ground for the Eagles, Balmer capped off his second consecutive 200-yard rushing week, totaling 211 yards and a touchdown on 29 carries, while catching his lone 14-yard touchdown reception. The Eagles’ defense proved to be crippling, helping Boulder City outgain Pahrump Valley 393-263 yards in total offense. Making a difference on both sides of the ball, Dunagan led the Eagles with 13 tackles, while Balmer made four tackles and an interception. Senior Samuel Chapel made six tackles, while Jones had five tackles. The Eagles look to match last season’s win total of three when they face Western on Friday at their homecoming game.